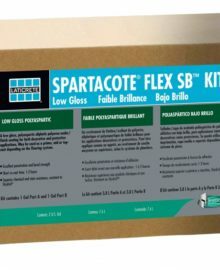 Super heavy duty Spartacote Brand FLEX SB fast drying Polyaspartic coating. Used in areas where a heavy duty coating is required with low odor and needs to be super fast drying (back in service in 12 hours or less). Re-coat time only 2-3 hours. Available in high gloss or low gloss versions. Includes 1 gal A & B. Easy to mix 50/50 ratio. Working time 20-25 minutes under standard 70 degree conditions. Can be used outdoors, will not yellow like epoxies. Can be used as a topcoat or standalone coating. For colored/pigmented version see ‘Tintable Spartacote’ (link). Non skid additives can be added to the product or broadcast on. Normally two coats are required. Easily applied with Spartacote application broom below. Coverage approximately 250 square feet/gal (500 sq ft/kit). Please chose option for HIGH GLOSS OR LOW GLOSS.